Studio and monitoring legends, the Beyerdynamic DT 770 Studio 80Ohm is a perfect pick for aspiring musicians. This is the headset to get if you need something to withstand bandmates or a small studio. Their time-tested sound and durability earn top marks for computer users and people who need something for tracking. If you want something to listen to on the subway, you're going to want to keep looking. If you’re a music-lover or budding musician, a set of tough-as-nails headphones is an absolute must. You’re going to be taking your sidekick of choice on all sorts of adventures—not all of them electronics-friendly. Going to college, on tour, or even just hanging out in a studio is murder on plastic over the long haul. That’s why you need to take a look at headphones like the Beyerdynamic DT 770 Studio. Editor’s note: this review was updated on February 22, 2019 to include test data. Who are these good for? Music creators with a need for a durable, high-quality set of tracking headphones in the recording booth. Something you can trust clients or bandmates not to kill accidentally. Casual listeners at the computer who need a super-comfortable set of closed-back headphones, or users with glasses. If you want durable headphones, it’s tough to go wrong with the DT 770 Studio. The reasons for these intended buyers will be made clear soon, but let’s continue, eh? Cracking open the box will reveal the Beyerdynamic DT 770 Studio headphones, a screw-on 1/4″ adapter, a carrying pouch, and assorted documentation. Like the vast majority of wired headphones, the Beyerdynamic DT 770 Studio uses a straight 3.5mm TRS-pin connector. As I mentioned before, there is also threading for a 1/4″ adapter. 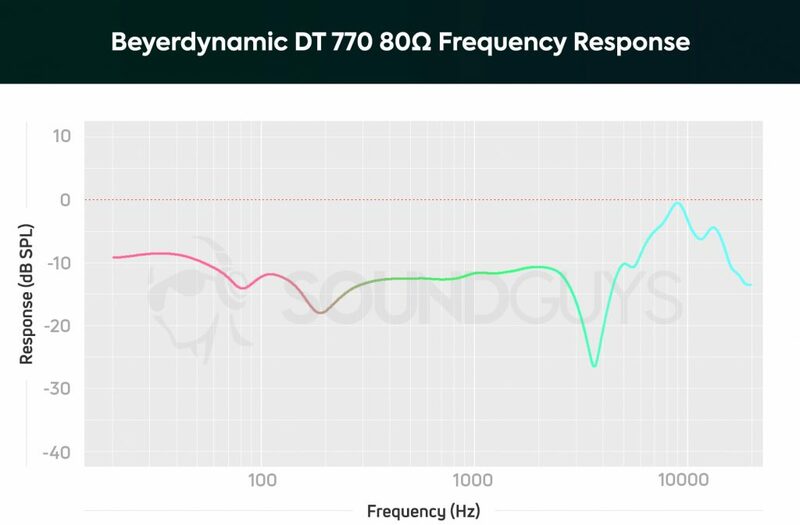 As you may have already guessed by the title of this review, the Beyerdynamic DT 770 Studio 80Ω headphones have a resistance of 80Ω. While that doesn’t mean that an amp is absolutely necessary, you may find that your smartphone isn’t always the greatest source for it to use. You may need an amp or sufficiently powerful unit to make the most of these headphones. As far as headphones go, Beyerdynamic’s design language has been ultra-clear for decades now: they want these things to last. To that end, the DT 770 Studio uses a lot of metal in its band and ear cup forks, along with a thick layer of durable hard plastic on the ear cups. The cable is protected by a lot of rubber and plastic, which is perfect for this type of headphone. A thick, removable band allows you to swap out dead parts whenever the fit starts to hurt. You may notice right away that these headphones use a velour padding, which is exactly the sort of thing that those with glasses prefer to leatherette earpads because it doesn’t squeak or catch when you move your head. It also has the added benefit of not trapping in heat as badly as the aforementioned alternative does. If you’re a sweaty person, you may decide you need to air it out from time to time—but the pads are easily removable for cleaning. If you’re worried about comfort, there’s no need; these can be used for hours without anything feeling off. If you’re in the middle of laying down some tracks, you’re going to be taking your headphones on and off a bunch, and using them for a really intense stretch of time. The last thing you want is your headphones’ clamping force to take you out of a vocal track or beat. This pair of headphones is built to be studio workhorses. If you’re not going to be using these at home, you’re going to want to use some zipties or something to rein in that cable, because it’s just under ten feet long. Not ideal for smartphone use. While I would have preferred a removable cable, the DT 770 Studio doesn’t use one, so if the cord snags with too much force, it could break. I’ve soldered Beyerdynamic cans back together for friends before, but it’s not something most people are willing to do. In that light, these are built more for the home or studio more than they are for a commute. Still, the relative fragility of the cord is something to pay attention to. Velour padding makes for a comfortable experience, especially if you wear glasses. It may not be flashy, but the Beyerdynamic DT 770 Studio is metal as hell. That long cable is great for moving around at home, but is terrible for a commute. Zip-tie that sucker if you want to listen on the train. 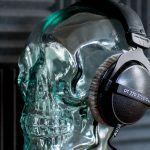 I’ve heard a really wide range of people putting forth opinions on this set of headphones, and the truth of the matter is that so many divergent articles can’t all be right. That’s because they aren’t. But I can help you out a little more than your average Amazon review can. With a consumer-friendly sound, it’s no wonder the DT 770 have been around for years. First things first, these are not “muddy” headphones, or whatever the hell words people like to use when describing sound they don’t like. You have to power them correctly. If you know that your computer or phone can handle it (say, by using an LG V30 or proper interface), these headphones can handle pretty much anything you throw at them, but you need to know that they’re a very bass-heavy set of cans. This simply means that the emphasis in anything that goes through them tends to favor the lower notes over all else. So while Barry White will sound fantastic, you may notice some higher-pitched male vocals may sound a little quieter than they should normally. Mids can take a bit of a backseat to the bass (very obvious in instrument-heavy Meat Loaf songs), but a properly-mixed track will preserve vocals and most instrument sounds quite nicely. However, you may notice that songs you mix with these end up with an over-emphasis on mids and weak highs. Leave these in the recording booth or at your computer. While they’re very decent isolators, you’ll get your best results with these indoors. Highs aren’t bad either, but they definitely bear that Beyerdynamic signature spike in emphasis. You may find that cymbals and other stringed instruments can sometimes leave you with a somewhat shrill ringing, but it’s really not all that common. If a track is properly mixed, you won’t notice this as much, outside of the fact that you can actually hear the cymbal shimmer. There’s a drop in emphasis right where mids transition to highs, and that’s a feature of many German-made headphones in order to avoid natural resonances of the human ear. It’s a little odd, but in truth it does more good than harm to your music. If you’re looking to build out a recording studio or just have a comfortable-as-hell set of computer cans, definitely take a look at the Beyerdynamic DT 770 Studio 80 Ohm. Seriously: they’re purpose-built for this situation, and you’ll be very happy you took the plunge. However, if you’re looking for commuting headphones: you’ll probably be better served by wireless or noise-cancelling headphones.